Within Data Vault there are special entities which leverage the query performance on the way out of the Data Vault. These entities are placed between the Data Vault and the Information Delivery Layer and are necessary for instances in which many joins and aggregations on the Raw Data Vault are executed what cause performance issues. This often happens when designing the virtualized fact tables in the information and data marts. Thus, to produce the required granularity in the fact tables without increasing the query time, Bridge tables come into play. Bridge tables belong to the Business Vault and have the purpose of improving performance, similar in manner to the PIT table which was discussed in a prior newsletter. As a means to achieve its goals, the bridge table materializes the grain shift that is often required within the information delivery process. Though, before we dig deeper into the specifics of using a bridge table for performance tuning, it is important to first define granularities within a data warehouse. 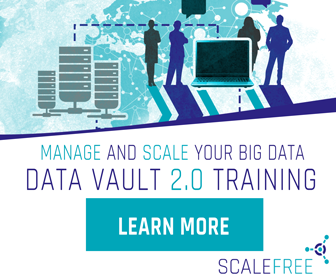 Skilled modeling is important to harness the full potential of Data Vault 2.0. To get the most out of the system due to scalability and performance, it also has to be built on an architecture which is completely insert only. On the way into the Data Vault, all update operations can be eliminated and loading processes simplified. In the past, we wrote about topics we were confronted with when we consult our clients or just recognized widely occurring discussions in the web. All these topics were already covered in Data Vault 2.0 and most of them moved into a higher focus within the last months. Coming with the trends in the private sector, NoSQL databases are now playing an important role for storing data fast from different source systems. This brings new opportunities to analyze the data, but also new challenges, i.e. how to query fast from those “semi”- and “unstructured” data, e.g. including Massive Parallel Processing (MPP). Furthermore, there is an abundance of tools to store, transport, transform and analyze the data, what often results in time and cost-intensive researching. The knowledge about “Schema on Write” and “Schema on Read” (and their differences) became very important to build a Data “Warehouse”. A Schema has been and is still mandatory for Business Analysts when they have to tie the data to business objects for analytical reasons. Storing your data in NoSQL platforms only (let’s call it a “Data Lake”) is a good approach to capture all your company’s data, but it became much more difficult for Business User to get the data out from those platforms. A good and recommended approach is to have both, a Data Lake AND a Data Warehouse combined in a Hybrid Architecture. How to scale in a disciplined agile manner? Earlier this year we talked about Managed Self-Service BI to explain how business users can take a benefit from this approach in Data Vault 2.0. Now we want to show you how to get there from a project management perspective, even in large companies where the standard Scrum approach often not works with the accorded deployment/release regulations and other approaches like the Disciplined Agile framework are the better fit. Agile transformation is hard because cultural change is hard. It’s not one problem that needs to be solved, but a series of hundreds of decisions affecting lots of people over a long period of time that affects relationships, processes, and even the state of mind of those working within the change. There are two fundamental visions about what it means to scale agile: Tailoring agile strategies to address the scaling challenges – such as geographic distribution, regulatory compliance, and large team size – faced by development teams and adopting agility across your organization. Both visions are important, but if you can’t successfully perform the former then there is little hope that you’ll be successful at the latter. The new General Data Protection Regulation (GDPR) is a law by the European Union (EU) and became effective on May 25, 2018. This new regulation is designed to put a high level of protection to personal data of European citizens, what means that companies around the world have to establish transparency and ownership to the individuals’ data and need to get a clear declaration of consent from them to save and process their personal data. Though laws from countries outside the EU (especially the USA) tend to favor business over consumer, GDPR affects all companies over the world who have personal data from EU-citizens in their database. WHAT IS NEW WITH GDPR? We often discuss relevant Big Data and associated Data Vault topics like “Hybrid Architecture”, “Data Lake” and “Hadoop” as we try to share our knowledge. Though this time around, we’d like to take some time to shift focus and talk about our company culture and commitment to our community. Data Warehouse and Data Lake – Do we still need a Data Warehouse? “Big Data”, “Data Lake”, “Data Swamp”, “Hybrid Architecture”, “NoSQL”, “Hadoop” … terms you are confronted with very often these days when you are dealing with data. Furthermore, the question comes up if you really need a data warehouse nowadays when you deal with a high variety and volume of data. We want to talk about what a data lake is, if we need a data warehouse when using NoSQL platforms like Hadoop, and how it is combined with Data Vault.